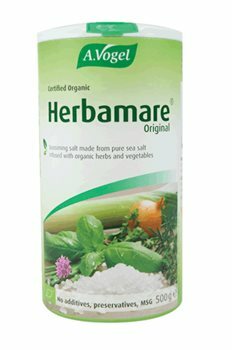 Original Herbamare is a combination of organic herbs, vegetables and sea salt, used to add flavour in cooking or as a table salt.Herbamare is made according to the original recipe of the world famous Swiss naturopath Alfred Vogel and is prepared with fresh, organically grown vegetables and herbs. The fresh vegetables and herbs are combined with natural sea salt and allowed to ‘steep’ for up to one year before the moisture is removed by a special vacuum process at low temperature. This steeping process integrates the full herb and vegetable flavour into the salt crystal. Sea salt, celery leaves*, leek*, cress*(water and garden), onion*, chive*, parsley*, lovage*, garlic*, basil*, marjoram*, rosemary*, thyme*, kelp (with trace iodine). I came across Herbamare when I was in Germany last year visiting my daughter. She was using it and I thought then that it was great and I bought some to take back with me to the UK as I had never seen it in any shops around where I live. I really missed the salt once my reserves were used up so I was delighted to find it on the Healthstuff website and at a good price too. Will definitely buy again. i no longer use normal salt as it just tastes bland compared to this. The taste is absolutly wonderful, it's my 5th bottle,great with every meal. Wonderful alternative to salt,couldnt live without it ! !